Exceptional on the black metal scene, The Axis Of Perdition is one of the most interesting British bands in the genre founded in 2000s. Multilevelled albums, huge amount of influences reflected in their sound and their own audio-visual world - all these rised our questions and to answer, here is Michael Blenkarn, member of this duo. Please tell us about the beginning of The Axis of Perdition. As far as I know initially it was a duo creating media of different types: stories, drawings, etc. The formation of TAOP involved quite a few disparate threads of our interests coming together, and I think the actual gestation of the band took up at least the first eighteen months of its existence in name. And even six months before we created the band, we had been making guitar-based dark ambient drones as Pulsefear, which is where the modern concept of the band (i.e. the nightmare world depicted by the music from “Physical Illucinations…” onwards) originated. However, at the time we didn’t realize that TAOP would take over this concept from Pulsefear. The first TAOP recording, the “Corridors” demo, was written by me (Michael) at a point where I felt I had reached a dead end with the black/death metal band (Minethorn) that I was in with Brooke. I wrote the demo as an experiment without any clear goal in mind, and invited Brooke to do the vocals and bass (though due to my poor mixing skills, the latter is effectively inaudible on the recording). We both recorded the electronic elements together, again out of a simple desire to experiment and do something different than from any real plan. The demo itself is a fairly straightforward piece of dissonant black metal (and I would say, perhaps the only item in our discography that can be called black metal) which attempts somewhat crudely to weld the epic wall-of-noise approach of Emperor and the hostile dissonance of Craft, topped off with surreal horror and sci-fi influenced lyrics. At the time we were also avid players of the Call of Cthulhu paper RPG, and had developed the Pulsefear concept as a playable world for that, accompanied by some rather clunky short fiction. Again, it wasn’t clear to us until TAOP had existed for a few months that the music we were creating and this world we were using in our RPG could work well together. Your demo was released as a part of a split with the project Pulsefear (we'll talk about it later). What inspired you to write music? Were there any definite influences in music at that moment? What I really enjoy is music that is evocative and creates imaginative worlds that you can get lost in. I found it very compelling that the first couple of Emperor albums (for example) were both incredible musically, especially “Anthems…”, but were also exceptionally rich lyrically, full of strong imagery and suggestive of an interior world which I could immerse myself in. It really gave the music an extra dimension that many bands lack. I was also heavily influenced by the use of different sounds in contemporary “classical” music, the use of different musical textures, timbres and gestures to create or represent images and moods (such as Mark Anthony Turnage’s “Three Screaming Popes”, written in tribute to a Francis Bacon triptych). I wanted to take both those approaches and combine them together to make music that was evocative on all levels, not just what was being played, but how it was played, recorded, arranged, etc. The demo split was issued limited to 20 copies by the band itself. Are there any plans to re-release it? Not at the moment, no. This may or may not change in future, I don’t know? In 2003 the debut album "The Ichneumon Method (And Less Welcome Techniques)" was released. If I understand correctly, 'ichneumon' is an insect in this case and 'the ichneumon method' is parasitizing of a larva in the body of another insect. Why have you chosen this exact name? The name “The Ichneumon Method” was chosen by Brooke and was originally also the name of the second Minethorn demo. It has a number of meanings – the most obvious being a reference to the parasites in the “Alien” films – but also representing, in a number of different ways, something which is hidden and unsuspected revealing itself suddenly and violently. It could involve an invading parasite, or the deranged thought that triggers a hitherto mild-mannered individual to lash out violently at their surroundings. The “method” part implies an intention and an agency; that whatever the result of this violent upheaval, something out there instigates it. In the latter example, some kind of dark, pernicious current or influence in the world that finds negativity, exploits and exacerbates it like a contagion. Somewhat abstract artwork can be understood in different ways: knowing that your interests in films (in this case "Alien" tetralogy) and Lovecraft's works are reflected in music one can suppose both variants. What was the initial idea? By the time we got round to creating the artwork for the album, we were starting to appreciate the idea that all the music could be said to be taking place in one nightmare world; the world we had created with Pulsefear and roleplaying. This artwork therefore is our first rudimentary attempt to provide some abstracted snapshots into that world. Because “The Ichneumon Method” incorporated a much wider range of inspirations than we would later use (which I’ll discuss more shortly), the imagery isn’t entirely consistent, especially the little fragments of text, some of which are totally inappropriate for the TAOP’s concept. I think we got better at this with subsequent releases. In the booklet of the album nicknames and abbreviations are given instead of names. Judging by one of them (Tetsuo Unit BRJ) I supposed your interest in Japanese cyberpunk. How much this theme interested you at that moment and what about now? I think we fell into a trap that a lot of young bands do. Faced with the opportunity to create our debut album, we took all the different ideas and a directions that we liked – horror, sci-fi, cyberpunk – and all the riffs from previous bands that we were still pleased with and lots more besides, and tried to crowbar them all into one album just in case we never had the chance to make another one. As a result it’s quite a psychedelic mess with lots of disparate images and styles crammed together. There was some “Silent Hill” fascination, a load of anime/cyberpunk influences, the Hellraiser films, Cronenberg films, and lots more. It was only after we’d tried to make a coherent album with all those different influences clashing with each other that we made a concerted effort to be more disciplined with subsequent albums. That’s when we decided to take concentrate solely on our own horror concept, which at the time was very “Silent Hill” influenced, and add the “The” onto the band name (we decided retroactively that “The Axis Of Perdition” was the antagonistic force, or source of “the darkness” in that nightmare world). The album was issued through the label Rage of Achilles. What impressions have this collaboration left? Why have you chosen this exact label? When the TAOP/Pulsefear split was finished, sent five or six demos to different labels and Rage of Achilles were the one that saw some potential in us. The label manager was really encouraged and enthusiastic and our experience on the label was excellent. Even though we’d moved on by that point, I was genuinely sad when I heard they closed down. Among the photos of crippled buildings and industrial landscapes there's a shot with a fragment of a pentagram in the booklet. Has it a special meaning, or maybe that was just accidental? How much different religious movements influence your works? That was definitely a mistake; so was including the line “Let Satan cling feebly to God, they shall be destroyed together”. We were still trying to work out what we were about at that point and I guess those could be called the last lingering traces of conventional black metal content in the TAOP canon. The next release, "Physical Illucinations in the Sewer of Xuchilbara (The Red God)", was planned as a part of a split with the French band Blut aus Nord, and also as a part of a cycle "Proto-Sub Frequencies of Visionnary Entities". Why this never happened? What other releases were planned as the continuation of the cycle? To be entirely honest, I can’t remember why it didn’t happen! I think it was a fairly boring logistical reason like finances or other commitments interfering, I remember that Appease Me had a lot of releases out in quite quick succession at the time, so it might have been to do with that, I really can’t remember! It was a shame though. I’m not sure what other releases were planned as a continuation of the series; Blut Aus Nord were the masterminds there so you’d have to ask them. Purely as speculation, I wouldn’t have been surprised if Reverence had been involved at some point if it had gone ahead. At one point we talked briefly with Reverence about doing a split 7” but that never materialized either, which I think was our fault for being disorganised. Looking ahead I can say that "Physical Illucinations in the Sewer of Xuchilbara (The Red God)" has become the most violent of your recordings. What feelings did you have when creating this material? The “Physical Illucinations…” EP was where TAOP’s raison d’etre really crystallised. TAOP as it is today is still following the same map we created with the EP, striving to do something different with the blend each time but representing the same essence. We felt a really intense sense of purpose and threw ourselves as much as possible into making the most vivid, visceral and immersive listening experience we could at the time. I think we’ve written technically better material since, and made albums I’m happier with, but the EP has an energy and vitality that we’ve never quite matched. I’ve certainly never heard Brooke experience such a vocal frenzy during recording; the vocals session took three hours in total and at the end I thought I might have to call him an ambulance. He was going through a very difficult, harsh time in his life and channeled all that negativity into his performance. I don’t know if he could do it again without reliving those circumstances and there’s no way I would wish that on him! This EP was the point when your interest in Silent Hill world got established and stayed in your music. Please tell us about how you've got acquainted with this phenomenon? Brooke introduced me to Silent Hill in Summer 2000, though I didn’t see much of it. We played through a lot more of the first game while recording with Pulsefear in Summer 2001, and played through the second game in January 2003 just after finishing and submitting “The Ichneumon Method”. The second one gripped me in a big way and for much of 2003 I was really fascinated and possibly a bit fixated on the series, buying my own PS2 and playing through the first three games myself. Hence “Physical Illucinations”, which we recorded in Summer 2003, was saturated with the influence, possibly excessively so. Though it’s all in the past and also an important part of the feeling of the EP, I regret the amount of samples we used, as I feel like we were trying to recycle the creators’ hard work and hitchhike on their creative impact. Anyway, when “The Room” came out in 2004 I was quite disappointed with it. For those first three games I would argue fervently that they were art in spite of the commercial medium, but while the subsequent games have been entertaining enough it seems to have become just a franchise, and my interests have moved elsewhere in the years since. It hasn’t been a major part of TAOP’s influences since the EP, really (“Deleted Scenes” was mainly influenced by “Session 9” and by developing our conceptual world for ourselves, and by “Urfe” we’d given up sampling altogether in favour of doing something that was entirely “us”). Most people continue to think we’re more “Silent Hill” worship than anything else, and while I feel that’s only true of the EP, we were so brazen and slavish about it I can understand why that image of us has persisted ever since. It’s still a fairly good reference point for new listeners. To paraphrase “Disturbance In The Perpetual Screen”, we have no one to blame but ourselves! The next release, "Deleted Scenes from the Transition Hospital", is very cinematographic, to my mind. Was this initially planned? Absolutely. It was the first release we did with a single narrative thread throughout, and the first that was fully mapped out on paper before we wrote a note. We wanted to build on what we’d achieved with “Physical Illucinations…” but make it richer, more evocative, more detailed and more cinematic in every way. It was also the first time we showed that the ambient/industrial soundscaping side of our sound is as important to us as the metallic side. Beginning from this full-length, The Axis of Perdition wasn't a duo any more. Why the decision to enlarge the line-up was taken? What is the contribution of the rest of the members to the composing of the material? I think it’s crucial for any band to introduce some fresh thinkers into the mix from time to time, to prevent stagnation and to help cultivate the sound in new ways. We’d been interested in working with a real drummer for some time, so getting Dan involved was obvious as soon as we realized he was interested. Unfortunately, though he had started recording his parts, Dan was unable to contribute to “Deleted Scenes” due to a back injury that incapacitated him for a few months; that’s why the album still has programmed drums and why the mixing of them is quite clicky, as they were added to the recordings at the last minute just before the deadline. Ian had been the bassist in Minethorn for a while before the first version of that band split, and had helped us out with recording “Silent Hill” samples for “Physical Illucinations” by playing through the game in one go while myself and Brooke manned the recording equipment. Involving both guys was also a step towards having a live incarnation of the band, another thing we were curious to experiment with. As it is stated on the label website, it was this album that became a bestseller. Was this release something new that moved you to a new level? I believe so. On balance, at the moment I would say it’s probably our best work and was received accordingly. The album "Urfe" is probably the least typical even for such an experimental band as TAOP is. Why have you decided to make, in fact, an audiobook? “Urfe” is probably our most contentious album, and there are a number of reasons it turned out the way it did. The album started life as another half-hour EP with the title “Grief of the Unclean”. It was intended to be a companion piece to “Tenements”, which we had already planned and had started writing. Since with “Deleted Scenes” we had consolidated what we felt was the core of our sound - i.e. a cinematic mixture of dark ambient/industrial and metal that genuinely blends the creative practices of the two different compositional approaches into one coherent sound – with the two following releases, we decided to go in both directions. That is, to do one release that was as ambient as we felt we could be without diluting the TAOP essence, and then to do a release that was as metal as we felt it could be without diluting the TAOP essence at the other end of the scale. Through the writing process for “Grief of the Unclean”, the material gradually expanded until we had around 45 minutes of music. At this point, we had already decided that instead of taking any samples from films (as we had on all previous releases) we would work with an actor to create our own cinematic quotes. I approached an old friend of mine, Leslie Simpson, who I knew had an exceptional knowledge of music, film, literature and all things esoteric and psychedelic, and who had enjoyed the “Deleted Scenes” album. With Les I had a number of late-night sessions at his flat, listening to music, drinking wine and discussing ideas and the TAOP world in great depth and detail, really analyzing and exploring its interior logic and mapping it out in a way we never had before. I can honestly say I’ve never had so much fun working on an album. After a few weeks, Les came back to me with a fifteen page long psychotic monologue full of horrible graphic imagery, esoteric references and literary salutes. We were totally stunned by the depth of his commitment to the project, and how he’d brought his own experiences and personality into it. We spent an evening recording his takes and after he’d left, me and Brooke decided more or less instantly to use the whole thing (originally it was meant to just be a resource for us to take “samples” from) and write enough extra music to accommodate it, renaming the whole album “Urfe”. What interested me the most about Les’s approach is that he created this stream of consciousness style narrative that disintegrates as you listen to it, leaving a flux of competing impressions, images and scenes that never quite resolve; like a dream. He also approached the writing as a musical exercise, choosing words and creating senses with a musical sense of rhythm and a diversity of texture, to help it integrate with the industrial/ambient material as part of the music rather than as separate from the music. Les wrote his parts to be part of the music rather than “on top” of it. As such, sometimes the words are interfered with and interwoven with the sounds that are happening around it. This is all intended to be part of the musical experience. Sometimes we deliberately disguised and glitched particular words even when they would’ve been perfectly intelligible otherwise, for the same reasons. If we were making an audio-book , we wouldn’t have done that. On both these counts, I strongly disagree with the description of “Urfe” as an audio-book. It’s a strictly musical experience, if an unconventional one, and it’s up to the listener to derive as little or as much meaning from it as they care to. Les made such a huge contribution to “Urfe” that we thought it would be rude not to count him as a full member, however it was never a given that he would continue to participate on later releases. Les is now living and working in Australia but we are still in touch; we provided him with some sounds for a short film earlier this year and we may collaborate again in future if the right opportunity presents itself. We thoroughly enjoyed working with him and I believe the feeling is mutual. The other important development from “Urfe” that is worth noting is that I’d completely updated my recording equipment, started using Ableton Live and was able to make digital field recordings for the first time, which completely changed my approach. I think “Urfe” suffers a bit from my novice enthusiasm with the new gear, as I don’t feel I really got the hang of it until at least the year after. Metal-elements are also included in the material of "Urfe". Didn't you think that this could influence the perception of the album in its entirety negatively? And what do these pieces of more classical TAOP material mean: reading an audiobook in a habitual musical vein or some addition to the main idea? At the time we made “Urfe”, despite wanting to make the least “metal” album we could without compromising the TAOP essence, we didn’t feel confident in removing the metal altogether from the recipe. I don’t know if that’s still the case nowadays. I think if you look at “Urfe” and “Tenements” as one big piece of work – which they are, conceptually at least – then you have a three CD piece that overall balances 50% metal and 50% ambient/industrial, which is the formula we’d previously established on “Deleted Scenes”. Since we didn’t feel confident that people would want to hear a completely metal-free TAOP release, we released the first two discs together (and it then took us a lot longer than we thought to complete the final disc). I don't think everyone can understand the full text of the audiobook at least because of lack of knowledge of the language. What is this book about? The spoken portions of “Urfe” are simply a different way we experimented with of depicting the TAOP world, which we see as being a psychedelic, psychoreactive world that constantly shifts and fluctuates around the minds of the individuals trapped inside it. The character of Urfe is simply an unfortunate soul who becomes entrapped in the nightmare and drawn into its heart, which reflects the landscape of his own subconscious. It is an anti-narrative driven by dream-logic and as such is meant to be experienced aesthetically rather than be understood, like Lynch’s “Inland Empire” or “Eraserhead”. The "Urfe" artwork can be divided into two parts: the images on the inner side are shots from a film "I Love You" (do you have any connection to its creation?) and excellent, though vague, photos. What was on them originally? They differ strongly from what you've done for your other albums: dark collages without any light colours. Do you take photos yourselves or use ready material just editing it? The early sepia-tinted digital collage style art we had on the first three releases was done by me, though the composition and content was usually developed with Brooke beforehand. The artwork for “Urfe” and “Tenements” are digital paintings created by Brooke; he got heavily into digital art a few years ago and I was happy to relinquish the task! Brooke also doctored the images from “I Love You”. The only link to “Urfe” the film has is the presence of Les, but he felt that the content of the film was very “Urfe”-like, hence he obtained stills for us to use. He also felt that Axelle Carolyn’s character in the film was a good representation of Pylon, the shaman of the Axis who appears several times during the course of the album. "Tenements (Of the Anointed Flesh)" has become a return to the roots, in a way: created with a new approach, it reminds the debut and the demos by Minethorn nevertheless. Do you agree? As it returns to a metal dominated sound, I would agree to an extent. However, we tried to push the metal component further than we ever have before, compositionally. After working heavily with ambient for the last two albums I think we needed the challenge of communicating the concept of TAOP primarily through the abstract medium of pure composition, with minimal recourse to concrete/industrial sounds (which communicate the themes in a much more direct way; the metal parts are there to suggest the parts of the world that are effectively indescribable). Also, as described earlier, we wanted to write an album that went as far in a metal direction as we felt we could go without compromising the TAOP essence. You've never published the lyrics before, but "Tenements" is an exception (to be honest, they are very hard to read because of the specific font). Why? Touching upon the artwork, another thing different from your previous releases is a really modest visual plan – almost all the booklet is covered with lyrics. Are the absence of the graphic part and the presence of the lyrics are connected? Originally, Les was going to have a much bigger role in “Tenements”. However as he was unable to take part in the album, we opted to complete the narrative of “Urfe” with sleeve-notes. We also felt that we couldn’t capture the images we had in mind using artwork, so text was the only remaining option. We also felt like challenging our own precedent, as we’d never shared lyrics before. As far as I know, someone has uploaded a pretty accurate transcription of the sleeve-notes of “Tenements” to our last.fm page, and a fairly good version of the text for “Urfe” without too many errors. The vocals on the two recent albums differ greatly from what you had on the early releases. Was this made deliberately or this feature is the result of the development of the vocals over the years? I think the answer to this question is really no more complicated than Brooke likes to try different things. On “The Ichneumon Method”, he experimented a lot with vocal effects and processing, and built up his confidence in his voice. With “Physical Illucinations…”, due to his life circumstances at the time, he opted for frenzied, cathartic screaming. For “Deleted Scenes” he kept a measure of that but developed a more ritualistic, ceremonial quality to his delivery, and continued this on “Urfe” and to a lesser extent on “Tenements”. Lastly, on “Tenements” he wanted to experiment more with clean vocals and also made extensive use of a vocoder to combine his voice with field recordings and industrial sounds at key moments. Each release of the band has lower and lower volume: while "The Ichneumon Method" nearly explodes the air, "Tenements" has a half lower volume. For what purpose do you do this? TAOP have basically learnt recording techniques from scratch, in public. We didn’t have the faintest idea what we were doing technically in the earlier days, just experimented and aimed for an abrasive and searing wall of sound. The first three releases are a learning process culminating in “Deleted Scenes”; then we completely changed our equipment and started learning all over again! However, of all our albums, I would most like to remix and remaster “Tenements”. At the time we were rushing to meet a deadline that we had made for ourselves, and I feel we didn’t do the material justice. Of all our albums, I am proudest of the composition on it, so I find it very frustrating. If we’d had more time to get it right, I’m sure it would have been our best all-round album to date. Having a drummer in the line-up, you prefer using the drum-machine. Does this express the intention to industrialize sound even more? Unfortunately, that’s a case of necessity rather than choice. As I mentioned earlier, Dan injured his back during “Deleted Scenes” and couldn’t take part; he also broke his arm very badly during the recording of “Tenements” which stopped him playing on that album and forced his hiatus from My Dying Bride. I’m hoping whenever we do our next album we don’t curse him! However, when we do use drum machines, we don’t feel bound to make something a drummer would play; we prefer to take full advantage of the opportunity to make something inhuman, wild, and unique. I never found any live video with your participation just as any information about your live shows. Do you focus entirely on the studio work? We are mainly a studio band. We like using the studio as an instrument, to make music that would be physically impossible to play live. We have, however, played two concerts in our career. Each album has some material on it that is not physically impossible to play live, so that we can still assemble a respectable live set if we need to, from throughout our discography. 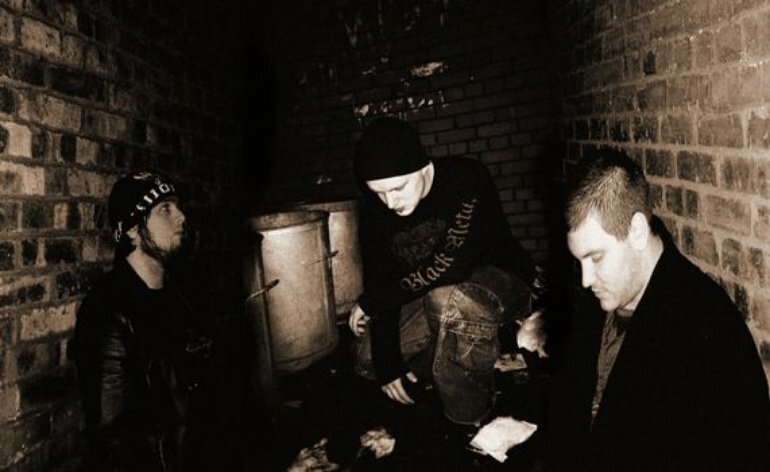 Of the two gigs we have played, the first was in London in December 2005, supporting Anaal Nathrakh. That one was an absolute disaster; it literally could not have gone worse unless one of us had exploded on stage. The second one was on Cancer benefit all-dayer in February 2010; Dan was unavailable for that one so we used backing tracks; it was also the first gig to feature the Wodensthrone guys (I played live electronics and Chris and Richard from Wodensthrone played lead and rhythm guitars respectively). The set was filmed though there is a problem with the audio going out of sync; we may put it on Youtube at some point. Your works are issued through the label Code666 for many years already. What impressions do you have from this collaboration? Code666 have been very supportive. It takes balls for a label to stand behind an album like “Urfe”, but they gave it 100%. Not many labels would have given us that opportunity but Code666 have always let us be ourselves. You often use doctor-patient terms in your works as it can be seen in the artwork. Why was this conception developed? My undergrad degree was Psychology and I have been fascinated ever since by Psychopathology and mental illness. The use of the imagery seemed to work well with our style, especially following the “Deleted Scenes” album. Nowadays the influence is more noticeable in my harsh electronics project Cauldhame. More than ever I research the content meticulously for this topic and try to represent the materials accurately, responsibly, ethically and compassionately.